The blue box had sat in the cabinet for months, waiting on Big Guy to get past his lust for the other blue box – the one he adored before we started avoiding dye. The one he had eaten a few times on vacation, which was enough to remind him of having loved and lost. 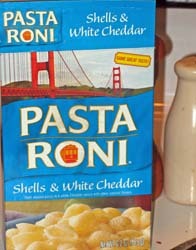 The substitute blue box of Pasta Roni shells and white cheddar, which I bought after reading every label in the grocery store in hopes of finding a mix without garlic, egg or dye, would just have to wait until Big Guy was either hungry enough or desperate enough for macaroni and cheese to give in. That time finally came tonight. I measured the butter and milk, but other than that, he pretty much did make it. That, and the previously mentioned hunger, was probably the only thing that got him over a combination of his long-standing resistance and a new angle he conjured up tonight. “This looks like snails,” he said. “When I was a kid, I used to think they were boats,” I said, and it was the total truth. Campbell’s Turkey Noodle still is “the soup with the boats” in my mind. He admitted while he was stirring that it “smells OK.” When he “accidentally” stuck his finger in the bowl as he carried it to the table, I knew he was hooked. “Oh, this is soooo good!” he exclaimed, his eyes lolling like they always do when he reaches food euphoria. Boots still had to be convinced, though. “This looks like snails,” he said. “It’s boats,” Big Guy assured him. To me, sooo good tasted sooo salty, but I cook with virtually no salt so that’s party why. It’s also because the sodium content is high – 670 milligrams (28 percent) for a half-cup serving, and I know the guys ate more than that because I had to make myself a sandwich for dinner. It is nice, though, to have a convenience food back on the pantry – I won’t do Annie’s Organic because of its egg warning, and every other item I’ve looked at that resembles macaroni and cheese has dye.